PHOTO OF THE DAY: With airlines and hotels discontinuing amenities to save money, frequent fliers are encouraged to use the ‘fresh remote’ pouch to polish their shoes and then take it with them to use as an air sickness bag on their trips home. Thanks to Heather’s earlier posts, Durex and Trojan suddenly lost their market share in the “Remote Cover” sector. Their “Phone Cover” sector was still going strong though. And once you take it off the remote, you can use it to polish your shoes. You, Jim, are a genius. LOL. Jim, Congratulations, you’ve won! Do you have a website you’d like me to link your name to? Hotels are working hard to combat the bed bug scare, but some have overzealously mis-interpreted the “bug” that was in some recent Sony hardware. Once again, another good one! What do people do with their remotes that requires a “fresh” remote? 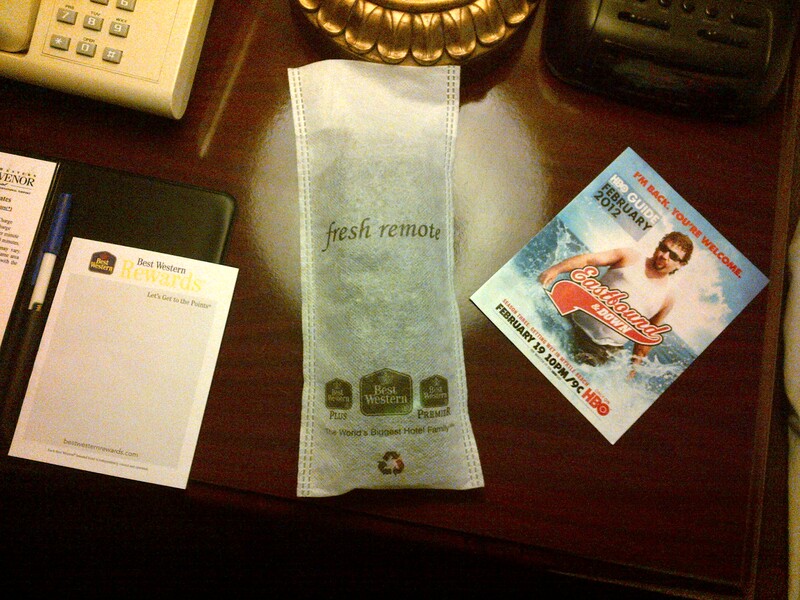 Caption: With airlines discontinuing amenities to save money, Best Western guests can take this ‘fresh remote’ pouch with them to use as an air sickness bag on their trips home. haha, you’ve been flying too much! Paul, Congratulations, you’ve won! Would you like me to link your name to your website? Instructions: To view X-rated movies, remove fresh remote cover. Actually, when viewing x-rated movies, please UTILIZE fresh remote cover! After complaints from the remotes about the condition of the people touching them, Best Western has implemented a “fresh remote” program to protect the remotes from the guests.